Southampton boss Ronald Koeman accused Sheffield United's coaching team of a lack of respect following Tuesday's 1-0 League Cup quarter-final defeat. 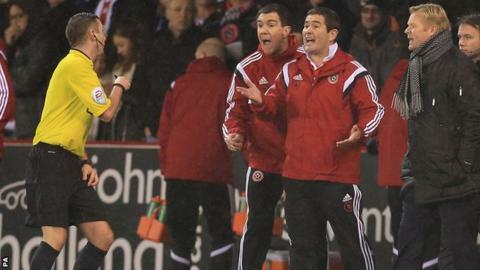 Koeman had angry words with Blades boss Nigel Clough and staff after the League One side scored at Bramall Lane. The Dutchman refused to shake hands after the game and said: "I shake hands with people who have respect for me and have respect for the fourth official. "The behaviour of Sheffield United's bench, I never saw that [before]." Sheffield United's first-team coach Chris Morgan was sent to the stands following heated exchanges in the wake of United striker Marc McNulty's winning goal and the Blades' subsequent celebrations in the 63rd minute. A feisty encounter in Sheffield produced eight yellow cards and saw Southampton defender Florin Gardos sent off late on for a foul on McNulty. Former Netherlands defender Koeman, whose Premier League side have now suffered five successive defeats after a bright start to the season, was also unhappy with Clough and Morgan's treatment of fourth official Paul Tierney during the match. Clough countered: "He's entitled to his opinion. I don't think one word should be said on it, we should be talking about how we have just beaten a Premier League side." Southampton captain Jose Fonte described the defeat as the lowest moment in his career at the club and said sorry to the supporters who made the trip to Bramall Lane. "First of all I would like to apologise to the 4,000 fans that made the effort to come here," Fonte told BBC Radio Solent. "It's not good enough, that was definitely the worst moment in my Southampton career because it is not every day you can be in a semi-final and I was really looking forward to it." Southampton face Everton in the Premier League on Saturday and Fonte has urged his team-mates to end their poor run of form. "Everyone is angry but we are the only ones who can take ourselves out of it," he said. "We have to stand up and be counted." Read more on Sheffield Utd: Nigel Clough says home advantage is "massive"